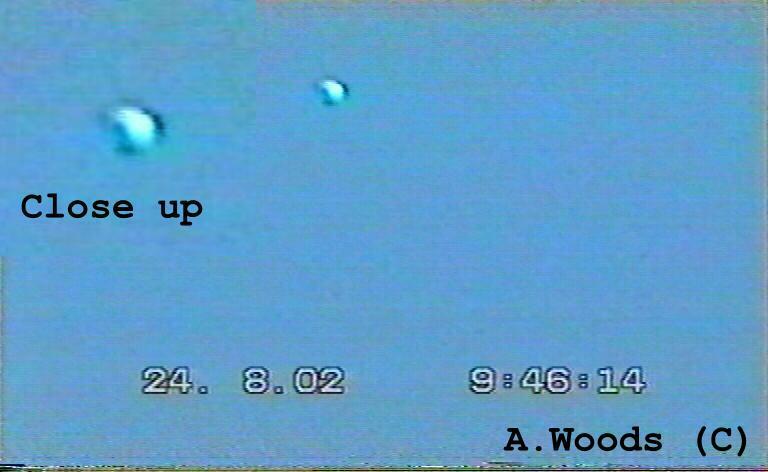 Anthony Woods would like it to be known that regrettably he has decided to distance himself and his family from the UFO subject. He has therefore ended all association with any and all parties who were previously involved in the release & promotion of his material. 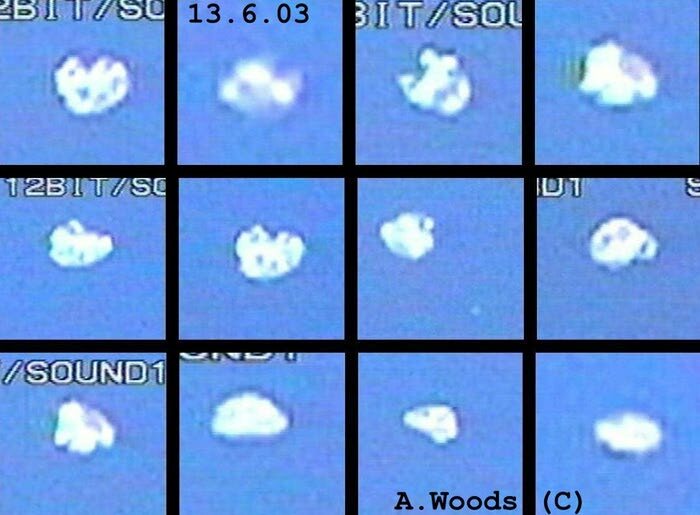 IF Anthony's footage or images have or are currently being distributed, sold or displayed publicly by ANY parties whatsoever, since the closure/liquidation of UFO Magazine UK as of February 2004, they do so ILLEGALLY! They are not authorized to do so, are in violation of copyright and Anthony's wishes. They do NOT represent Anthony Woods in any way, shape or form. Anthony has agreed with the Rense site for his articles to remain on their site for posterity, exclusively. He would like to take this opportunity to thank both Jeff Rense & James Neff for the kindness and support they have shown towards him and his case. He would also like to thank the Rense visitors for their interest & support of his case over recent years. "If by showing my material has changed just one persons life or views on the reality of this phenomenon, then it was all worth it"
THROUGHOUT the summer of 2002 I was fortunate enough to film several interesting sightings, some of my best footage since the fleets footage showing clear intelligence which happened in August -- in particular on the 13.8.02 I was lucky to film several very good sightings including a sphere that crossed the sky at tremendous speed passing through the clouds as it went over head & a double sphere sighting where both objects together instantaneously blinked out on film in less than one frame. 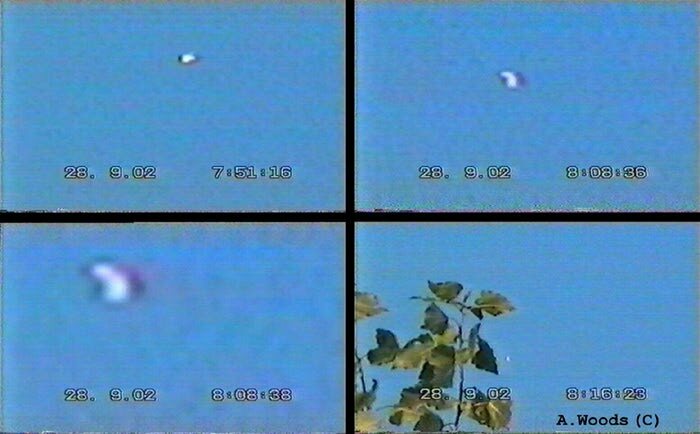 Another interesting sighting clearly shows intelligence happened several days later on the 16.8.02 above my parents home; I managed to film a sphere that hovered absolutely motionless for over 10 minutes high in the sky, eventually the object moved off slowly but I managed to get over twenty minutes of footage. 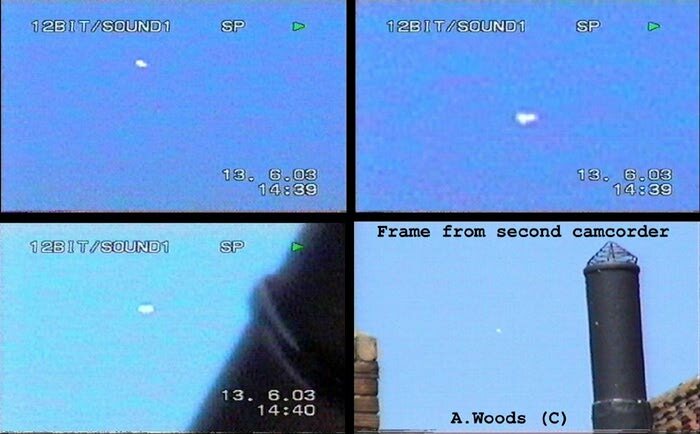 Then on the 24.8.02 both myself and Tony my brother-in-law witnessed a very unusual object which was very bright & appeared from nowhere, it slowly crossed the sky above my home before stopping suddenly and vanishing on the spot. This was truly remarkable to witness not least for the strong & luminous colour that emanated from the object, it was so evident that what ever this object was it was illuminated from within and not just surface reflection. But it wasn't until the end of September 2002 that I would go on and witnessed and film probably my best sighting since the fantastic sightings I managed to film back in March. It happened early in the morning of the 28th September, it happened just like so many other sightings before where I had just opened the door to my back garden and there they were, directly above my home. I noticed this large object sitting motionless in the sky, the object looked quite high up but still it looked big to the eye -- at a guess as big as a commercial jet. After staring at the object briefly for a few seconds with amazement I quickly ran back indoors and grabbed hold of my camcorder and tripod because I new I had plenty of time to get it on the tripod because this object was going nowhere in a hurry. Over the next half an hour I filmed some excellent footage of this object, most of it on a tripod and with good reference points. On playback of the footage you could clearly make out that this object was rotating continuously and shaped very odd like a cashew; it was really bizarre. 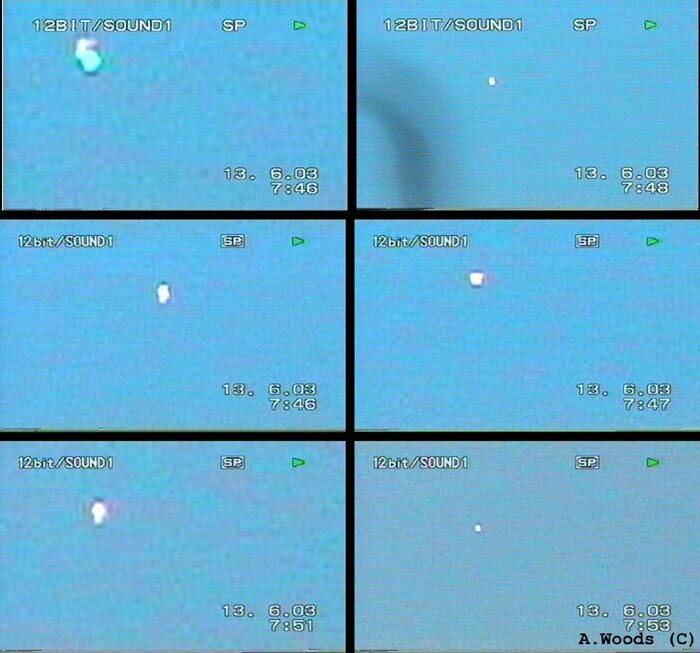 In the next following few months coming to the end of 2002 I filmed several interesting sightings but it wasn't until January 2003 that I filmed a quite significant UFO in more ways than one. 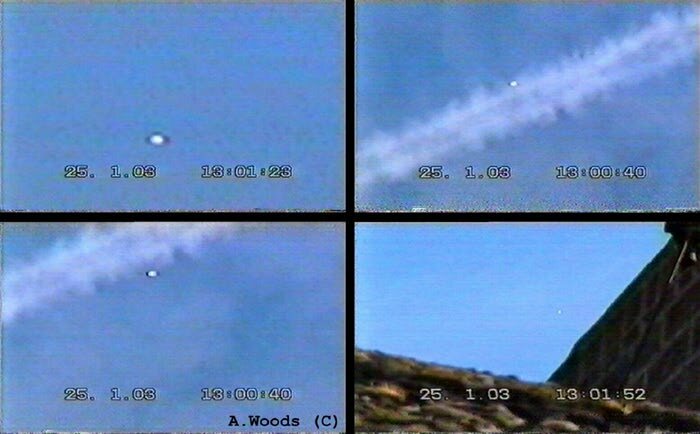 It happened on the afternoon of the 25th January & was witnessed by members of ufo magazine (uk) who happened to be visiting me. 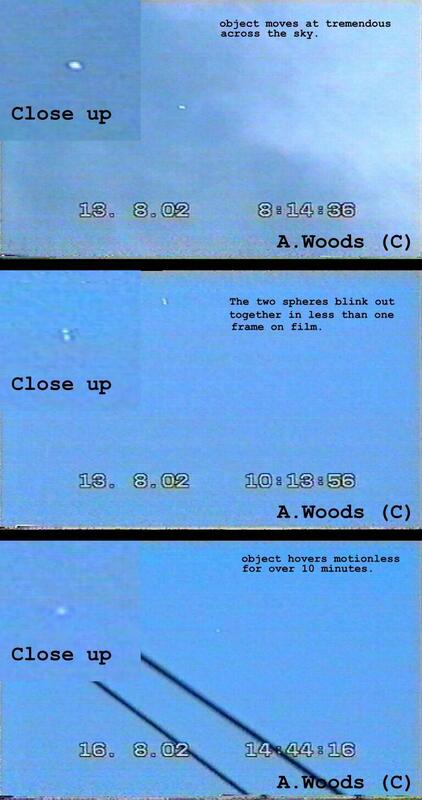 This object was witnessed by 4 independent observers and filmed on three separate camcorders. For the first few months of 2003 the skies seemed fairly quiet in comparison to the same time the previous year, but I think the bad weather in the early part of 2003 had a big part to play. In March, April and May I filmed several sightings but it wasn't until June of 2003 that the sightings would start to increase significantly. Friday the 13th June may seem unlucky for some but on this day I would go on to witness my best sightings so far of 2003. It all started early in the morning, once again I had just opened the door to my back garden when I noticed an object sitting stationary in the sky to the left of my position, I quickly rushed indoors to get my camcorder when I got back the object hadn't moved at all. I started to film this very bright & strange UFO for around 20 minutes. This craft appeared to morph & expand itself continuously, it was really bizarre to witness. Eventually it moved off very slowly and out of my view. After all the excitement of witnessing this sighting I had a strong premonition more was to come on that day. I rang my brother-in-law up "Tony" and told him he had to get to my house as quickly as he could, within the next couple of hours my best sighting of the day would happen. It was around 11am when to the west of our position high in the sky we noticed what we thought was a single stationary object. My brother-in-law located the object through his binoculars whilst I was trying to locate it through my camcorder. It started to move forward very slowly heading south east, directly above our position. At this point I decided to stop filming for a second and get my tripod. As I was fumbling trying to attach my camcorder to the tripod the object suddenly and dramatically dropped in altitude, it was really breathtaking to see this. 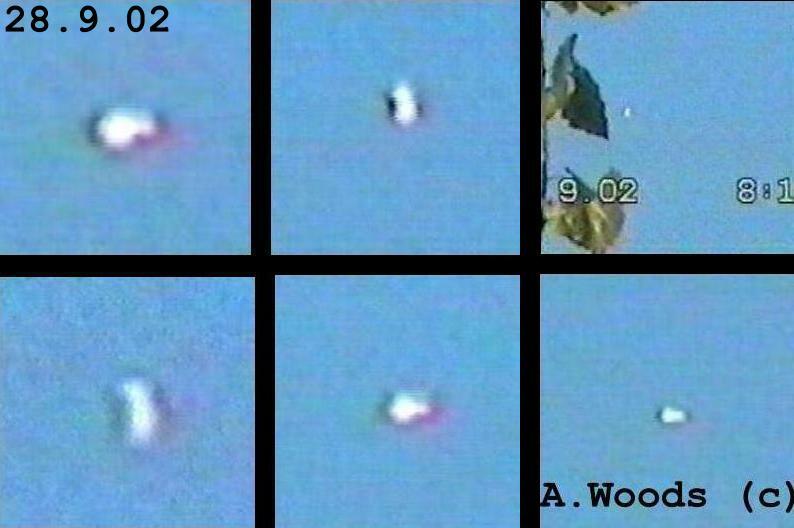 Suddenly we could make out real detail of the UFO. In my panic I decided to abandon the tripod and just get my camcorder on the object as quickly as I could, at this point my brother-in-law could make out fantastic detail on the craft, he said he could make out that the craft was in fact a group of luminous but semi-transparent spheres encased in what looked like a plasma shell keeping them together. We also noticed there were several detached spheres shooting around this large plasma sphere object. Suddenly and dramatically again the object or objects performed a clear intelligent action by changing direction in a semi-circle turn and moving off heading north. At this point the object picked up more speed but I managed to film it for several more minutes as it silently and graciously went into the distance. 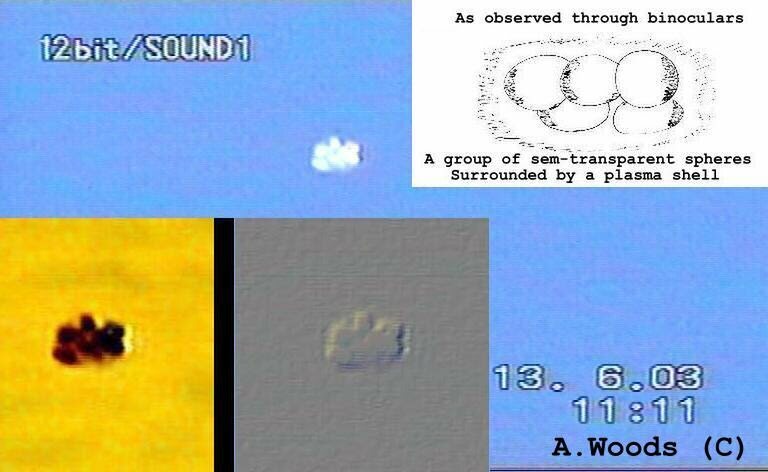 This sighting was a truly remarkable, one of those very rare sightings in the 4 years of filming this phenomenon I had been lucky enough to have witnessed and filmed these spheres close enough to make out real clear detail. From my own experience of observing these objects it is evident they have the capability to be individual objects "when required" or they can morph or join up to make a larger craft. When they come together there seems to be some sort of energy or plasma substance that surrounds and holds them together. The more I see these objects the more I am certain they are living individual life forces of some sort rather than manufactured vehicles. Yet again within 2 hours of witnessing my best ever sighting of the year, this object returned again for another visit, this time both my wife and myself managed to film it on two separate camcorders for over 10 minutes. We will be presenting more Images and statements from Anthoy Woods throughout the week, so be sure to watch the feature block for each installment in this multi-part series.